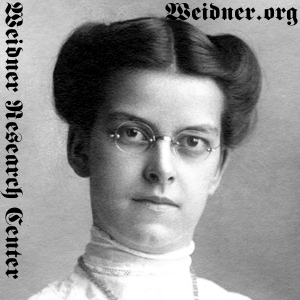 Rose Weidner. Courtesy of Raupp Memorial Museum, Buffalo Grove, Illinois. [S7] St. Mary Catholic Church, St. Mary's School Dedication, 144, 152. [S261] Arlington Heights Herald, 18 Oct 1962, sect. 1, p. 7, col. 4. [S286] Herald, The, 10 Dec 1971, sect. 1 p. 2, col. 1. [S539] National Archives - Great Lakes Region Certificate of Arrival #11-81021, 10 April 1933; Declaration of Intention Case # 92203, 3 May 1933; Petition for Naturalization Case # 144658, 144658, Petition for Naturalization page; given name only (01 Oct 1936), Chicago, Cook County, Illinois, USA. [S11] John J. Weidner, Compiled Birth, Death, 669. [S63] Arlington Heights Herald, 17 Nov 1938, p. 5, col. 4. [S399] Unknown, ca. 06 Apr 1986, Unknown. [S11] John J. Weidner, Compiled Birth, Death, 669 date only. [S286] Herald, The, 10 Dec 1971, sect. 1 p. 2, col. 1, date and location; states she was born 30 January 1889. [S405] The Cemetery Committee, Vernon Township Cemetery Inscriptions, Lake County, Illinois, 113 headstone states she was born 30 Jan 1889. [S539] National Archives - Great Lakes Region Certificate of Arrival #11-81021, 10 April 1933; Declaration of Intention Case # 92203, 3 May 1933; Petition for Naturalization Case # 144658, 144658, Petition for Naturalization page; birth date and location (01 Oct 1936), Chicago, Cook County, Illinois, USA. [S539] National Archives - Great Lakes Region Certificate of Arrival #11-81021, 10 April 1933; Declaration of Intention Case # 92203, 3 May 1933; Petition for Naturalization Case # 144658, 144658, Petition for Naturalization page; marriage date, city, and state only (01 Oct 1936), Chicago, Cook County, Illinois, USA. [S286] Herald, The, 10 Dec 1971, sect. 1 p. 2, col. 1, date only. [S405] The Cemetery Committee, Vernon Township Cemetery Inscriptions, Lake County, Illinois, 113 headstone states she died 8 Dec 1971.